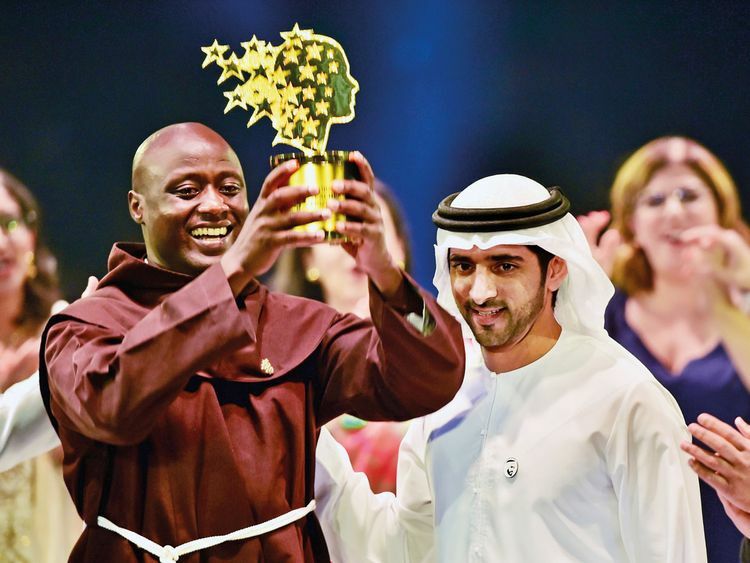 Dubai: A teacher from rural Kenya has won the $1 million prize for the world's best teacher, beating 10,000 other nominations from 179 countries. The award, announced on Sunday night in Dubai, recognises his "exceptional" teacher's commitment to pupils in a remote part of Kenya's Rift Valley. Accepting the prize, Tabichi said: "I am only here because of what my students have achieved. This prize gives them a chance. It tells the world that they can do anything." Tabichi gives away 80 per cent of his pay to support pupils, at the Keriko Mixed Day Secondary School in the remote village of Pwani Village, Nakuru, who otherwise could not afford uniforms or books. "It's not all about money," said Tabichi, whose pupils are almost all from very disadvantaged families. Many are orphaned or have lost a parent. The award-winning teacher is a member of the Franciscan religious order, a member of the Catholic religious order founded by St Francis of Assisi in the 13th Century. The 36-year-old teacher hailed the potential of Africa's young population. "Africa's young people will no longer be held back by low expectations. Africa will produce scientists, engineers, entrepreneurs whose names will be one day famous in every corner of the world. And girls will be a huge part of this story," he added. Tabichi teaches science to high schoolers in the semi-arid village of Pwani where almost a third of children are orphans or have only one parent. Drought and famine are common. The school has a student-teacher ratio of 58 to 1. His goal is to raise aspirations and to promote the cause of science, not just in Kenya but across Africa. Tabichi’s mother died when he was just 11 years old, leaving his father, a primary school teacher, with the job of raising him and his siblings alone. When he accepted his award, he pointed to his father in the audience, invited him up on stage and handed him the award to hold as the room erupted in applause and cheers. The Kenyan government-run school where Tabichi is a teacher has just one computer and shoddy Internet access. The school also has no library and no laboratory. Many students in his school suffer from drug abuse, teenage pregnancies, dropping out early from school, young marriages and suicide. The lack of a reliable Internet connection means he has to travel to a cyber-café to download resources for his science lessons, which he pays for out of his own pocket. Not only did he give away his monthly wages, but he also spent his weekends tutoring students. One of his main challenges is to persuade the local community to recognise the value of education, visiting families whose children are at risk of dropping out of school. He also actively tries to change the minds of families who expect their daughters to get married at an early age —encouraging them to keep their girls in school. Tabichi's first time ever on an airplane was coming to Dubai to claim his prize. He also met actor Hugh Jackman and Dubai's Crown Prince Shaikh Hamdan Bin Mohammad bin Rashid Al Maktoum. Despite the grave obstacles Tabichi and his students face, he is credited with helping many of them stay in school, qualify for international competitions in science and engineering and go on to college. Kenyan President Uhuru Kenyatta said in a video message: "Peter, your story is the story of Africa, a young continent bursting with talent. You give me faith that Africa's best days are ahead of us and your story will light the way for future generations," he said.